A regular column concerning business in an emerging market, and its relationship with Japan. Despite Thailand’s continued political unrest, business has not been dramatically affected. The kingdom of Thailand is ranked as one of the most popular tourist destinations in the world. Known for its scenic natural landscapes, beautiful beach destinations and rich, exotic culture—not to forget an abundance of shopping venues in the capital city, Bangkok. In 2007, the Tourism Authority of Thailand (TAT) recorded 14.5 million international visitors, of which around 1.3 million were from Japan. But not all is well in this tropical paradise. The country has had repeated political upheaval— and tourism has suffered. Standoffs at Government House in the capital between supporters of the People’s Alliance for Democracy (PAD) and the current government, led by Prime Minister Somchai Wongsawat, have been making headlines around the world. The resulting violent clashes have left 400 injured and two dead. Some political analysts predicted that another military coup would be the only way out of the current crisis. Meanwhile, at a safe distance from his opponents, ousted premier Thaksin and his wife had just requested political asylum in the UK. Thailand’s recent political troubles seem to have begun when telecommunications multimillionaire Thaksin Shinawatra and his Thai Rak Thai (TRT) party rose to power. Thaksin was first elected in a landslide victory in January 2001, on a populist platform of economic growth and development, his main support base being voters in the poorer rural areas of Thailand. Following his re-election in February 2005, allegations of corruption started emerging against his government. But the straw that broke the camel’s back was the sale of the Shinawatra’s family share of Shin Corporation to Singaporean Temasek Holdings in 2006, which was widely considered to be a violation of Thai laws governing foreign investments in the telecom sector. Not long after, on September 19, 2006, there was a non-violent coup d’état, led by a group of top-ranking military officers. The TRT was disbanded and multiparty elections under provisions of a new constitution were held, resulting in a victory for the People’s Power Party (PPP). Unfortunately this did not restore peace to the nation. With many regarding the PPP as a proxy for the disbanded TRT party and questioning PPP leader and newly appointed Prime Minister Samak’s allegiances to TRT, protestors led by the PAD called for his resignation. After Samak was forced out of office, Somchai Wongsawat stepped in to take his place. Some surmised this as another unfortunate choice, as Somchai is Thaksin’s brother-in-law. At the time of going to press, Thailand’s Supreme Court found ousted Prime Minister Thaksin guilty of corruption, and sentenced him in absentia to two years in prison. The country borders Myanmar (Burma), Laos, Cambodia and Malaysia. To add to Thailand’s troubles, there are also the regular outbursts of violence in Thailand’s southern border provinces, believed to stem from historical grievances of the ethnic Malay Muslim population who have fought against forced assimilation by successive ethnic Thai Buddhist governments for almost a century. Despite the political turmoil, there is still plenty of business being done, says seasoned risk analyst Steve Vickers, CEO of International Risk Limited. Surprisingly, he sees no need to advise his clients against conducting business in Thailand at this time. “Thailand has always operated very well in spite of the government,” he says. “It’s business as usual.” He does concede that “the paralysis of parts of the government is absolutely unhealthy” and cautions that business might suffer in the longer term if the political insecurity drags on. For many years prior to the economic crisis of 1997, Thailand was one of the three fastest-growing economies in the world, averaging over 7 percent annual real GDP growth. 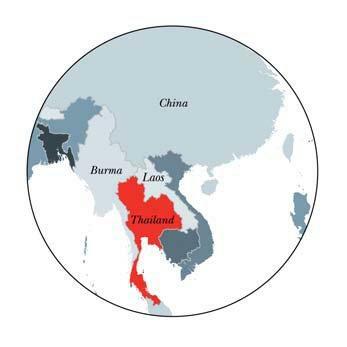 The Thai economy relies heavily on the export of goods and services, accounting for over 70 percent of its GDP in 2007. Last year, its GDP was $246 billion, with a GDP growth rate of 4.8 percent. With an annual GDP per capita of around $3,720, and a population of 65 million, Thailand can be classified as South-East Asia’s fourth richest economy after Singapore, Brunei and Malaysia. Vickers points out that the Japanese have been doing business in Thailand for over 30 years and that “if it is not perceived as a problem for the big Japanese corporations, then it is not a problem for the rest of the wider Japanese community—Japanese businesses tend to take the lead from the larger Japanese corporations.” Japanese expatriates are among the largest group of foreign nationals. The embassy’s official figures indicate that nearly 43,000 residents are registered; actual figures could be twice as high, with the number of Japanese residents rising on average at a rate of around 10 percent for the past few years. Vice President Nemoto Hiroyuki of the Japan External Trade Organization (JETRO) shares Vickers’ view that Japanese companies familiar with operating in Thailand appear unfazed by the current political impasse, although new investment might be adversely impacted. However, despite the rising labor costs, Thailand still has the competitive edge over neighboring countries like Vietnam and Cambodia. “Thailand is more developed, with a better infrastructure and better industrial clusters,” Nemoto says. Vickers feels that despite the political uncertainty, Thailand will continue to be an attractive investment destination, up to the point when the popular king, HM King Bhumibol Adulyadej, passes away, at which point a careful re-examination of the Thai political situation will need to take place. There are an estimated 6,000 to 7,000 Japanese companies operating here, mostly in the electronics and automotive industries, of which 1,300 are registered at the Japanese Chamber of Commerce in Bangkok. The Eastern Seaboard, a.k.a. “the Detroit of Thailand,” southeast of Bangkok, is the country’s third largest manufacturing base for Japanese automobile corporations. In 2007, Thailand exported approximately 690,000 vehicles, of which more than 80 percent were built by Japanese manufacturers. Last year marked the 120th anniversary of diplomatic relations between the two nations, celebrated through a series of cultural events and activities, including the signing of a strategically important bilateral free trade agreement, the Japan-Thailand Economic Partnership Agreement (JTEPA). Thailand’s tariff on imported cars and automotive parts will be gradually reduced, while Japan conceded to gradual tariff cuts and the immediate abolition of duties for Thai food and fruit exports. This year Japan has overtaken the US as Thailand’s most important export market, with approximately 12 percent, or $13,552 million, of all Thai exports destined for Japan. The majority of Thailand’s exports are in the automobile, petrochemicals and electronics sectors, while tourism is expected to contribute around 7 percent to its economy. Other significant sources of revenue are agricultural products such as rice (Thailand is the largest exporter of rice in the world), fish and fishery products, tapioca, rubber, corn, coconuts and sugarcane. Conversely, Japan is Thailand’s leading source of imports, with 20 percent (representing $28 billion) of the imports to Thailand coming from Japan. The majority of these are machinery, parts, iron, steel and electronic integrated circuits. In 2007, bilateral trade between Japan and Thailand amounted to $46 billion. Despite the ongoing political crisis, the expectation is that ultimately Thailand will overcome its challenges and the relations between Japan and Thailand as regional and global partners will continue to flourish.